Anita got a REALLY nice one !! 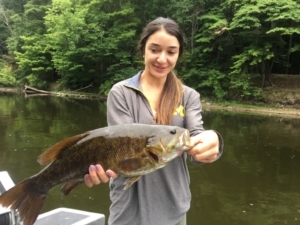 The Muskegon river fishing report for August 20, 2018 in the Newaygo, Michigan area is about the continued pursuit of Smallmouth Bass ! !…..and an occasional Northern Pike or Walleye. Despite very low water levels this entire summer, we’re able to access certain stretches of the Muskegon river to find some good fishing. Click HERE to read a summary of sorts, about summer fishing on the Muskegon river. With both fly fishing and light spin tackle equipment, getting into fish is only a matter of time with where fish are “holding” at this time of summer. The most recent forecast is calling for some potentially good rains overnight and into tomorrow. If we’re lucky enough, we could see conditions improve on many of west Michigan’s great rivers in the days ahead. HERE is our most recent forecast for the Muskegon, Michigan area. This will likely see fall run Chinook salmon come into certain rivers in the NW Michigan area and I will be guiding on the Pere Marquette over the next month or so, in pursuit of some of the BEASTS that are swimming in lake Michigan. Granted, there does not “appear” to be a lot of those giants, but we’ll have to see how fall pans out before the verdict is in. Present water temperatures on the Muskegon river where I have been fishing as of late are coming in around the 70-71 degree mark. Click HERE for current Muskegon river flow data.